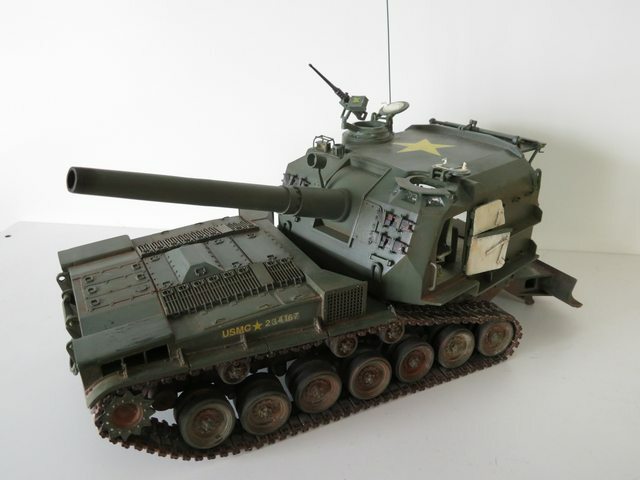 Here is my final product of my M55 SPG. It is the old Renwal kit, 1:30 I think. 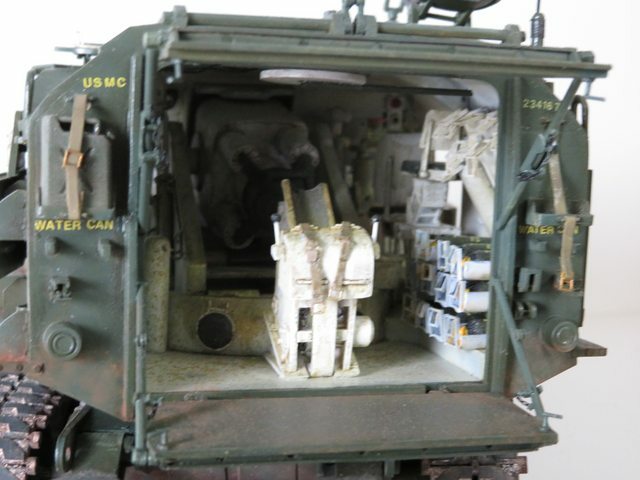 I put in a complete interior, sanded off all outside moldings on the turret ane replaced, modifed the the front headlights, sanded off the jerry cans and refitted them along with all the detail. 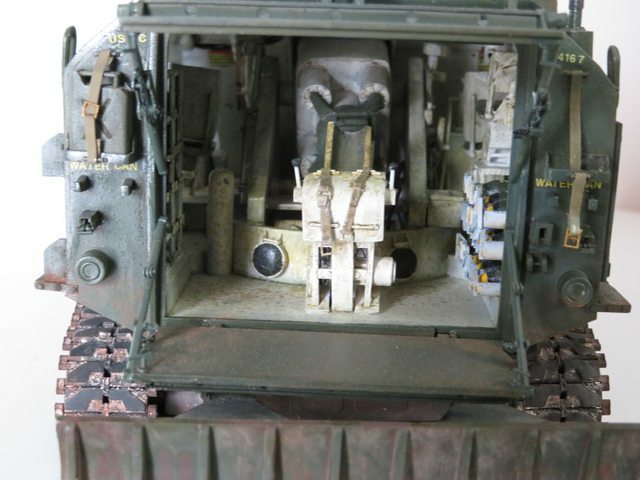 Used AFV M60 tracks. Painted Tamyia USMC green (mix of several different colors to get what I want) and weathered with various pigments to get that Vietnam earth feeling. I know those voices in my head are not real, but man,,,do they have some good ideas. If I can't make it to your funeral, I will send a message saying...I approve. Dang, that’s nice! Great job! What year is that kit from? Do you remember the colors that you used and the mix ratios? I've been searching for a good tamiya Marine Corps green and your`s looks spot on!!! I brought one back in 1966. Think it was about 2 - 3 bucks then. You've WORKED MIRACLES with that old RENWAL DOG!!! KUDOS!!! 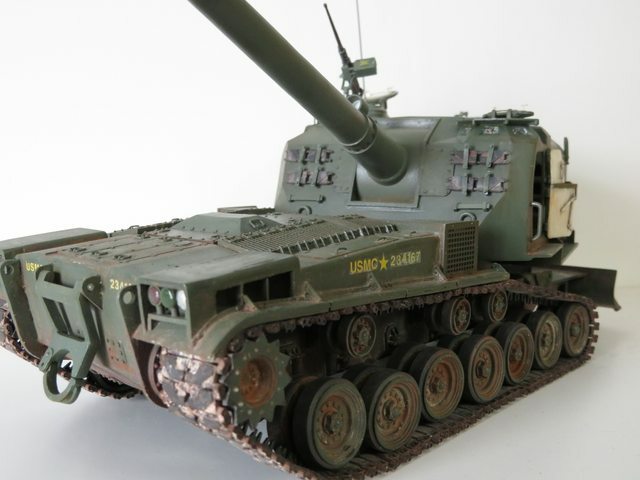 The 1/32nd scale Renwal kits were first issued around 1957. 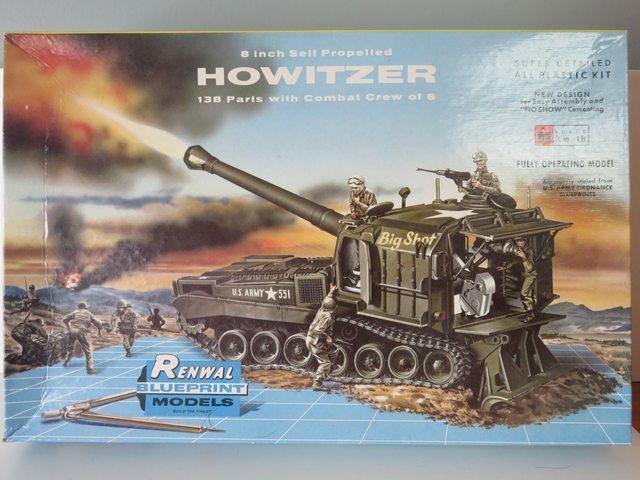 Revell-USA owns the molds now, and occasionally repops the kits as nostalgia items. And the model you see here is a vast improvement over what was in Renwal's box. Isn't it amazing what a really bad old kit can be turned into once there's a modeler with sufficient dedication to the cause? 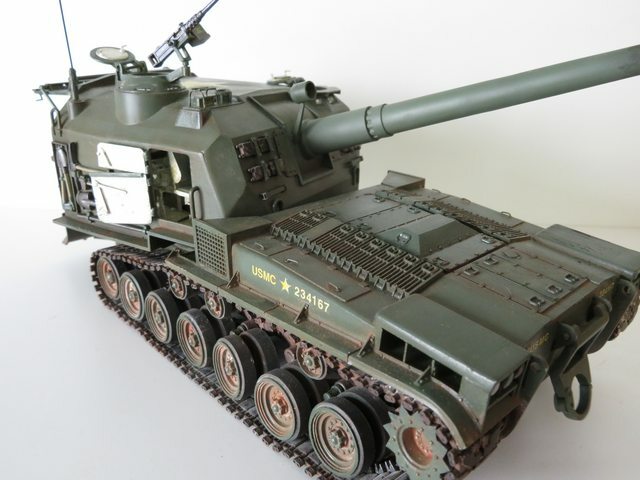 At any rate, doing an up to date M55 kit would be a challenge for any kit maker, but at the same time a big chance to win the "kit of the year" prize! Jack, great job on a really old casting. I built two of these, one when it was first issued in the 60s. The real thing was built at Pacific Car and Foundry, which was about three miles from my boyhood home. I used to ride my bike down to their Renton WA plant, and sit along the fence line of the plant and marvel at all the equipment that moved in and out. One day in the summer of 1967 or 68, an entire train of M55s came into the plant-- probably for rebuilding, but possibly for scrapping. They were pretty dirty. A few months later, there were at least twenty lined up in pristine condition, I'm assuming rebuilds-- on the way out to somewhere. I agree, this is one of my favorite SP guns. 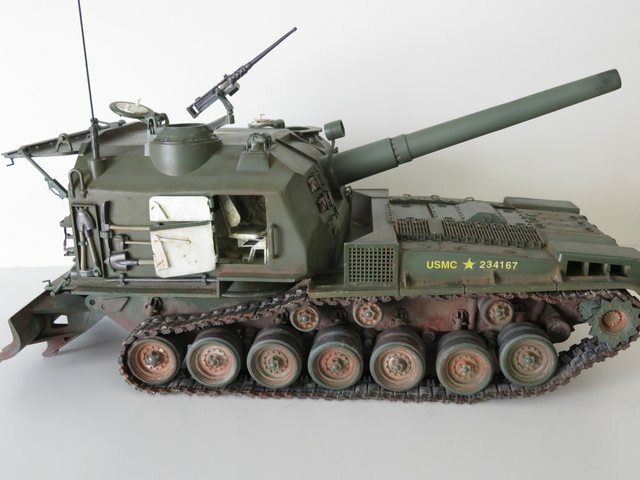 I never thought we'd ever see an M19, but Bronco has released one-- so maybe there's hope for the old M55 yet. There is one on display at the Fort Lewis Military Museum now, but it's in bad shape. great build ,well done . However from memory,,,here is what I believe I used. Percentages are approx. You will have to play around a bit, but it should be close. I believe you ask this on the other site, if so let me know you are the same person otherwise I will post it there as well. I had asked it on the Tank Modeling Facebook page after seeing your post here. Thanks! Very nice. I just purchased this kit and waiting for it to arrive. Searching for some completed builds I found this thread. It looks fabulous and I hope mine looks even half as good, then I would be happy. I have found these old Renwal tools have a lot of character to them. This would be my fourth Renwal. My first was the Atomic Cannon, then their M47 Patton, then the Teracruzer, this one will be my fourth. Seeing your build gives me good vibes about building it. Simply outstanding! Amazing transformation of an ancient kit into a showstopper. Well done Sir. Removed by original poster on 04/16/19 - 00:30:48 (GMT). "OOOOHHH YES"---THE FRESH SMELL OF CORDITE IN THE MORNING, AND THE ARTY DUELS WE HAD WITH THE NVA AT KHE SANH !! I USED TO GET VOLUNTERED TO PASS UP AMMO TO THE GUN AND GET BOUNCED ABOUT TWO FEET INTO THE AIR EVERY TIME WE FIRED ! GEEEZZZ THAT WAS FUN !!!! CHEERS: MIKE. & SEMPER FI !! The m55 was never in RVN. There was one batallion of m53's that came in up near Phu Bai in 1965. All were junk by mid 68, but with one or two survivors. 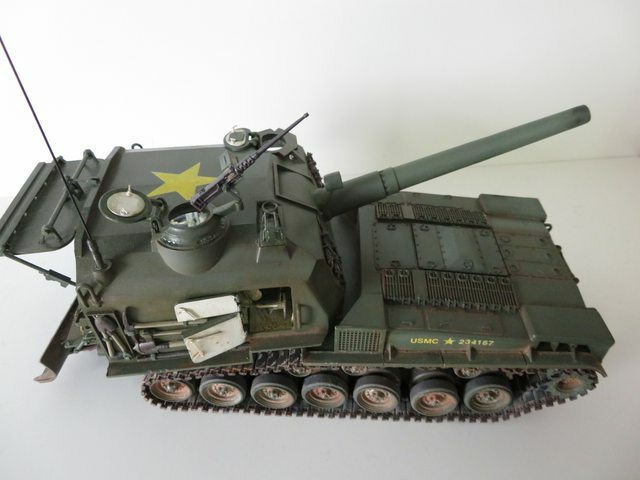 All Arty heavier than a 155 used by Marine units were actually Army m110/107 platforms. They didn't start training Marines on heavy stuff till early 68, and even then there was only two or three classes of about thirty men. Nice work, but where did the driver sit? Driver sat in the turret. 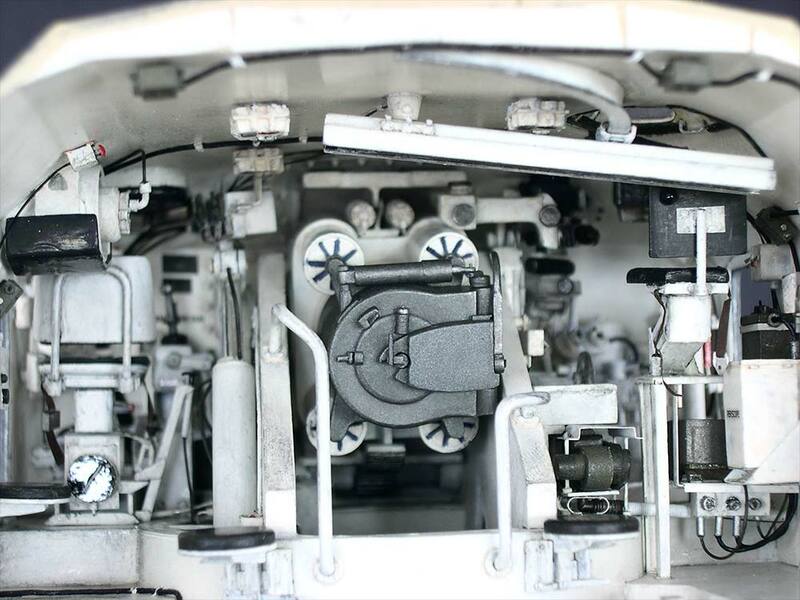 The driver's seat in the front left corner of the turret can be seen in the pic of my model that Steve kindly posted (thank you, Steve!). See the references at the end of my article for prototype photos.